With an October release set in stone, Rockstar Games has slowly been pulling back the curtain on Red Dead Redemption 2, giving gamers a glimpse of what’s in store for those who enjoy exploring the Wild West. Earlier today, Rockstar released a brand new gameplay trailer, which showcases a variety of gameplay mechanics and features. The video, which you can check out for yourself above, kicks off with protagonist Arthur Morgan, as he engages in fisticuffs onboard a moving train. Before long, we’re treated to a handful of environments that players will be able to fully explore, from snowcapped mountains to burning oil fields. This time around, it seems like the developers are putting an emphasis on letting players naturally stumble upon gameplay moments, instead of having to chase down objectives through in-game maps and waypoints. Experiences range from more elaborate heists, like robbing a train or a bank, to smaller, personal missions. As the video describes, you can hold up a stagecoach, burgle houses and stores, or simply take off into the wilds and explore — though you’ll need to keep an eye out for outlaws and other gangs, as well as law enforcement. We also get another glimpse at the Dead Eye system, which allows Arthur to slow down time to take out enemies and aim at critical weak points. 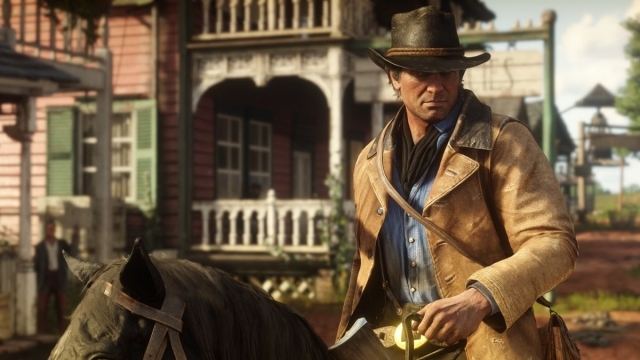 Outside of missions, Arthur will have plenty of distractions to keep him busy, from fishing, playing cards, and altering his look and attire. Needless to say, it seems like players will have plenty to sink their teeth into when Red Dead Redemption 2 launches on October 26 for PlayStation 4 and Xbox One.